Gum disease is an infection or inflammation of the gums that can affect the bone that supports and surrounds your teeth. Its main cause is bacteria in plaque that buildup in between your teeth and gums. If not cleaned away through routine oral healthcare like brushing and flossing, the gum and bone tissue around your teeth can become loose and cause them to fall out. Gingivitis: The earliest stage of gum disease, gingivitis, can still be reversed since it hasn’t damaged any bone or connective tissue. You may notice bleeding when brushing or flossing due to inflammation caused by plaque buildup. Periodontitis: During this stage, your bone and connective tissue have become irreversibly damaged. You may start to see pockets forming below your teeth, which trap plaque and bacteria. At this stage, you should seek treatment to prevent further damage. 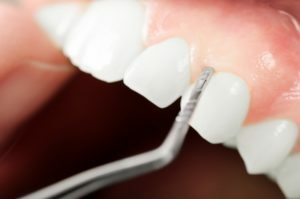 Advanced Periodontitis: In this final stage, your teeth will start to shift or loosen due to destroyed supporting bone and connective tissue. This can affect your alignment, bite, and your teeth may need to be taken out. Good oral healthcare routine: Brush twice a day and floss once a day to clean away plaque and bacteria that cause gum disease. See Your dentist: Get in to see your dentist for regular checkups to make sure your disease free! They are your best resource of detecting early signs of gum disease. Healthy choices: Tobacco use and smoking is a leading risk factor of gum disease, so try quitting for the new year if you can! Now that you know more about gum disease and what signs to look for, use these prevention tips to keep your gums healthy for a great looking and feeling smile. Dr. Sarah Esparza is an experienced dentist who has a passion for providing quality care. She believes in patient education, which is why she wants you to know about the stages of gum disease. She currently runs Esparza Family Dentistry, and she can be contacted through her website or by phone at (757) 499-4707 for any questions.